Mount Vernon, Illinois bed and breakfasts offer their hospitality during your visit to our beautiful town in south central Illinois! Before selecting a Mount Vernon, IL hotel for your stay, check into our beautiful area inns. With ample hospitality and accommodations to rival the finest hotels, Mount Vernon’s B&Bs provide a truly relaxing and indulgent getaway. While in Mount Vernon, be sure to visit the Cedarhurst Center for the Arts, where the arts are celebrated year-round through both visual and performing arts. This 90-acre site of rolling landscapes and woods is home to the Cedarhurst Sculpture Park, home to over 60 large-scale sculptures. Cedarhurst’s Shrode Art Center, an on-site art studio where Cedarhurst members are welcome to use the facilities. Art classes are also held at the Shrode Art Center for the general public. The Mitchell Art Museum contains art exhibitions and a children’s gallery. The Cedarhurst Center for the Arts also hosts the annual Cedarhurst Craft Fair weekend in the late summer. Well over 100 craftsmen in all areas of art will display wares for show and sale. A children’s area will feature games and craft projects. Food and live music are also offered. Mount Vernon is also steeped in history. The Jefferson County Historical Village contains both original and reproduced buildings from the 19th and early 20th centuries and is open throughout the summer months. The Mount Vernon Appellate Courthouse is on the National Register of Historic Places and was the site of the Illinois Supreme Court from 1857 to 1897. Important lawyers, including Abraham Lincoln, came to our courthouse to argue their cases. The Heartland Rivers Wine Trail and its member wineries welcome visitors from around the world. Mount Vernon’s own GenKota Winery should be your first destination on this trail, featuring their stunning main building with a large, open deck overlooking their picturesque vineyard. 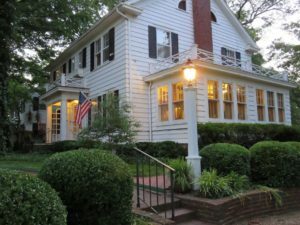 Let Mount Vernon’s member inns of the Illinois Bed and Breakfast Association provide you comfort and hospitality during your stay in the heart of Jefferson County!